Description: The meteorological station at Södra Midsjöbanken is measuring the climatic conditions in order to evaluate the potential of building a wind farm with approximately 300 tubrines at the site. 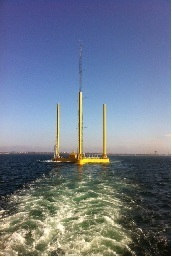 The mast is mounted on a jack up platform. Information on sensors can be found in the list below.